In the niche of mortgage loans, a VA loan is a type of credit guaranteed by the Department of Veteran Affairs (VA), available only to U.S. veterans or their surviving spouses. The terms of this type of mortgage loan are usually better than the loans available to the general population and can be accessed only under certain circumstances. As far as benefits are concerned, VA loans allow the applying veterans to purchase a home without providing a down payment for it, and without any private mortgage insurance (or a need for a second mortgage). The amount lent to the home buyer is up to 103.3% of the property value, which means that the mortgage can cover all or some of the closing costs. This includes a VA funding fee (which is paid directly to the VA), which can vary from 0 to 3.3%, and under special circumstances, this fee too can be financed separately. Regarding VA loan limits, the maximum amount which maybe borrowed like this is $417,000 as of January 2012. 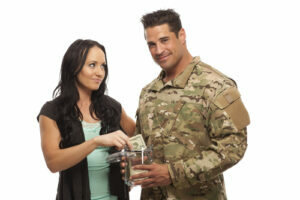 Everything is designed to help the veteran buy a house as smoothly as possible. What about closing costs for VA home loans, you may wonder. While the VA funding fee (see the paragraph above) may be paid in cash or included directly in the amount borrowed, the closing costs for a VA loan are most often not included in the loan itself. The closing costs may cover VA appraisal, title search, the loan processing fee, credit report and so on, and they are basically banking costs. Since only a few selected banks and institutions are in a partnership with the VA for offering these special loans, the responsibility for the closing costs is usually taken on by the buyer or possibly by the seller on behalf of the applicant (the veteran) through Seller’s Concession. This type of arrangement is not mandatory for the seller but it is very common. In case the applicant had trouble keeping up with the monthly payments for their initial loan or in case they need to set up a second mortgage for any other reason, VA loans allow them to do that through another VA refinancing loan. In this case, the loan is known as an IRRRL Refinance, meaning a VA loan refinancing to a VA loan. The amount borrowed is up to 100.5% of the original amount, where the 0.5% extra represents the funding fee for a VA Interest Rate Reduction Refinance. If you’re interested in applying for a VA loan yourself or you’re simply curious as to how much would one of these loans add up to and how would a monthly payment look like, this VA loan calculator provides a great estimate for anything you’d like to know. Please note that beyond the calculator’s broad estimations, more deductions and benefits could be available to an applying veteran, so it’s best to contact your VA lender to discuss all the details.